Could a subscription model work for music software? Is paying by the month better than buying outright? Soundation Studio: try it for free; pay a subscription fee for full access. Indeed, you might argue that this is one of the reasons piracy is rife. Consumers simply don't perceive value in digital products, so they don't see why they shouldn't just have them for free. As a result, there's a lot of debate about how content should be sold, leading companies to experiment with subscription models. Here, customers pay a flat fee (usually monthly) to have access to a specific or unlimited amount of material. It's an age-old model that conjures up images of magazines plopping regularly through letterboxes and paperboys lugging sackfuls of daily papers around. "There's a lot of debate about how content should be sold, leading companies to experiment with subscription models." In the digital sphere, one of the most high-profile exponents of this system is Spotify, which gives you limitless music for a fixed monthly fee. In the TV and movie world, Netflix and Lovefilm operate on similar lines. Furthermore, media-creation software giant Adobe recently announced a subscription plan that allows users to pay a monthly fee to access any of its applications, including its Audition audio editor. So, could this model work for other music software and soundware? Perhaps the most obvious candidate for a subscription model would be a piece of music software that works online (you'd never really be able to 'own' that anyway). Enter PowerFX's Soundation Studio. Although this can be used by anyone, if you want the full experience, you must choose one of three subscription options. These add recording functionality and varying amounts of storage space and additional content. We spoke to PowerFX's Bil Bryant about why he adopted this model. "With Soundation we are offering software as a service, and we knew we wanted to work from the freemium model," he says. "We looked at different pricing structures and combined that with our PowerFX experience with soundware development and sales. This gave us a good idea of what our users would like and how much they could pay. Although we also have non-subscription-based offerings, our monthly subscription offering is our most successful." The word 'freemium' is important here - Bryant feels that his pricing structure only works because, like Spotify, people can use his service up to a point without having to pay anything. "Our goal is to give everyone the opportunity to make digital music," he says. "No downloads, no barriers - just go use all the free features. You only pay if you want more sounds or functionality. Also, prior to Soundation Studio, sequencers online didn't really work, so it would be difficult to get people to even try it if we set up a pay barrier." Soundware creator Puremagnetik also offers subscriptions. Its Micropaks are released to members on a monthly basis, then made available to anyone to buy as one-off purchases later on. Company founder and lead sound designer Micah Frank says that, this way, he can offer real value to his customers. "We wanted to provide easily accessible sounds on a regular schedule and simultaneously create a new space for soundware distribution," he tells us. "The subscription model was an experiment at first, but we realised within a few months that it was working. The goal was to make it easy for people to sign up by offering 'no-brainer' prices for interesting, specialised content. I think the subscription model has worked very well, although more than half of our business is still à la carte." It's important to note that Puremagnetik subscribers can keep their content even if they choose to cancel their membership. "I don't see any point in offering content that the user is suddenly locked out of," says Frank. It's easy to see the logic in offering online software and samples on a subscription basis, but what of DAWs and plug-ins that install on your computer? Axis Plug-ins is the brainchild of Bastian Schnürle, and he's decided to offer his complete product range - currently comprising only the Inspektor Analyzing Suite, but due to grow soon, he says - for €79 a year. He cites two reasons for choosing this model: piracy and sustainability. "I thought Axis Plug-ins could solve [the piracy] issue by providing a set of high-quality plug-ins for a small annual fee," says Schnürle. "A fee so small that even a musician who does not earn so much money can afford quality digital audio plug-ins and does not have to steal them." On the issue of sustainability, Schnürle believes that, because of the constant OS/software update cycle, traditional pricing models can do serious damage to small-scale software companies. "If a company has a lot of different plug-ins, it takes a long time to update them all, especially if it's a one-man-brand. The time the company uses for updating is lost for new developments, and new developments are the only income if updates are provided for free. This creates a vicious circle that kills the small company of a passionate developer." How does Schnürle respond to those who are uncomfortable with his model because they'd never feel like they actually 'owned' the software? "This is the better system for licensed goods like software or music," he says. "Your antivirus software is based on a subscription model. You may hear your music via a flat-rate provider and pay a monthly fee. If you are a scientist, you may use MATLAB, which is one of the most important pieces of engineering software in the world: the fee to use MATLAB is around $7000 per year. 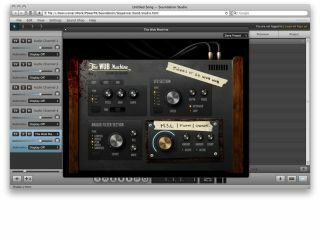 So why should it be different for digital audio plug-ins?" Bil Bryant believes that, while the ownership issue is a barrier to be overcome, things could be changing. "I certainly understand that mentality, but I do think we are moving away from that mind-set, especially kids," he says. "Software and tech are developing at such a rapid pace - and some of these programs cost so much and can be rendered obsolete very quickly - that it is tough to make such a financial commitment." Would it be feasible, then, for someone to release a subscription-based, hard drive-installing DAW? "I think yes, especially with new users," says Bryant. "They understand that there is a learning curve and many potential buyers are unsure if their skill or desire will justify the price." Micah Frank also believes that things are changing. "Eventually, when the bulk of our CPU is remotely processed, the subscription model will be more prevalent," he says. It remains to be seen whether computer musicians are willing to buy into the subscription model but, as Bil Bryant notes, "access rather than ownership is a concept that is rapidly gaining speed". This article originally appeared in issue 181 of Computer Music magazine.